New Okami in the Works? A new trademark filed by Capcom suggests that the company might be exploring a future for what most had deemed a dead franchise: Okami. It was best to let Okami go. The game, developed by the now defunct Clover Studios and released on the PS2 and later Wii, didn't exactly light up the charts despite cult love and critical acclaim, and when it's developers went their own way, most assumed that a sequel was not in the works. And rightfully so - with its creators (including central mastermind Hideki Kamiya) busy with other things, even if a sequel did happen, it might not have the same magic. And yet, hope springs eternal and the unbelievable may happen. Capcom has filed a trademark for something called Okamiden. Would Capcom really file for something with the word "Okami" in it and not plan on having it have something to do with the series? It's certainly possible, but I think a tad unlikely. What's the "den" mean, then? Well, Siliconera suggested that it could be a Japanese word play for a combination of Okami Gaiden or Okami Densentsu - which could mean "Okami Side-story" or "Okami Legend," roughly translated. So maybe some sort of spin-off game? 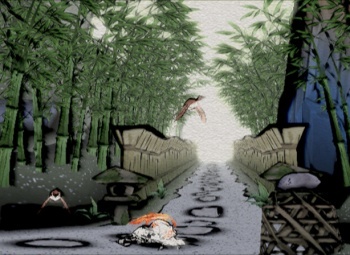 The Wii version of Okami isn't due for release until this Fall in Japan. Capcom could be planning an announcement of this Okami whatever it is to coincide with that, or they might just be trademarking things to cover their bases or just mess with us. I wouldn't put it past them. Now, can I see a God Hand trademark, please?